"I heard that people are investing money in you." Netflix has finally unveiled the official trailer for The Polka King, a film which premiered at the Sundance Film Festival this year (back in January) and will be released on Netflix just before the Sundance Film Festival next year (in early 2018). Jack Black stars as Jan Lewan, a Polish immigrant who became the "King of Pennsylvania Polka" and started a Polka Ponzi scheme. This is based on a true story and it almost seems too crazy to be real, but it is. The cast includes Jenny Slate, Jason Schwartzman, Jacki Weaver, J.B. Smoove, and Willie Garson. This reminds me of Jack Black's other good dramatic role, in Linklater's Bernie, but it's an entirely different story. I heard some solid buzz on this at Sundance, but it seems to have been forgotten until its return now. Take a look. In the film, Jack Black stars as Jan Lewan, a Polish immigrant who became the "King of Pennsylvania Polka." A believer in the American Dream, Jan worked hard and dreamed bigger, but with big dreams come big mistakes. Based on a true story, the film, co-written and directed by Maya Forbes and Wally Wolodarsky, mixes comedy and tragedy showing the world’s only known Polka Ponzi scheme. 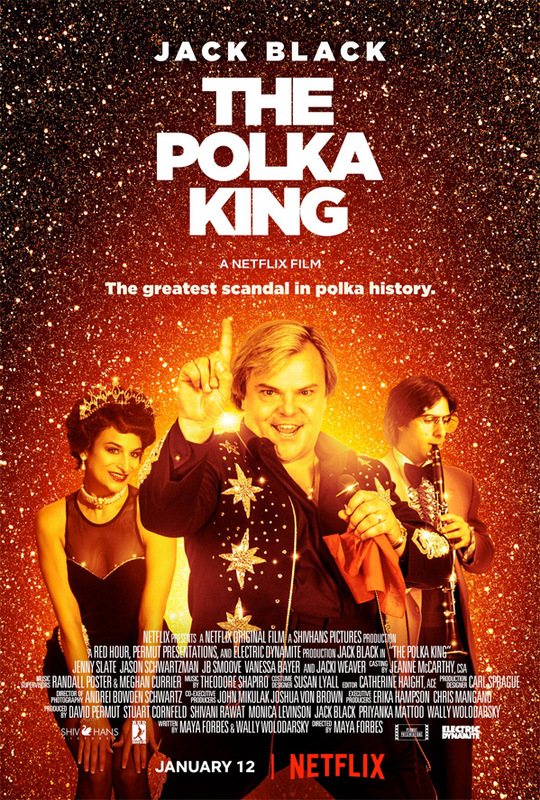 The Polka King is both written and directed by filmmakers Maya Forbes (of Infinitely Polar Bear) and Wallace Wolodarsky (of Sorority Boys, Seeing Other People, Coldblooded). This first premiered at the Sundance Film Festival at the beginning of this year, but didn't play at many other fests. Netflix will finally release The Polka King streaming exclusively starting on January 12th, 2018 at the beginning of next year. Thoughts?